Intensive Stain Removal non-abrasive whitening toothpaste. 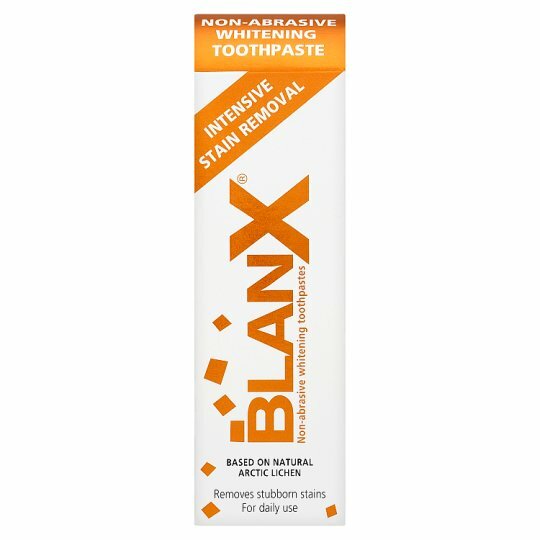 BlanX® Intensive Stain Removal effectively removes stubborn stains caused by smoke, food, drink and plaque. Its unique formula, which contains lichens and bamboo micropowder, is specially designed to restore the natural whiteness of teeth. Its intense aroma leaves the mouth feeling fresh, while the active ingredients effectively prevent the build up of plaque and tartar. Healthy white teeth are an essential beauty must-have, but many whitening methods use harsh abrasives which can really damage tooth enamel. BlanX® works differently from all other whitening toothpastes by helping you achieve that sought-after look without harming your teeth. The BlanX® range of product are the only daily cosmetic whitening toothpastes that use lichen, grown naturally in the Arctic. Lichen contains active ingredients which attack harmful bacteria involved in the formation of plaque and tooth decay - not the beneficial bacteria found naturally in the mouth. Used daily, BlanX® gives you a gentler, whiter smile.